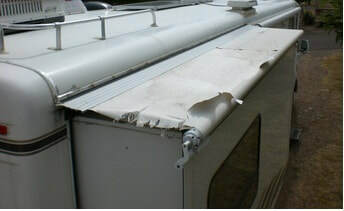 Does Your Recreational Vehicle Slide-Out Awnings Look Like This? We are a provider of top quality, Custom Made Replacement Fabric For RV Slide-Out's. Replace Your Old, Worn-Out Slide Topper Awning Fabric With A New Custom Made Replacement Awning! We Have Competitive Pricing, And A Great Product. Our 15oz. awning fabric, is a HEAVY DUTY Tri-Vinyl Laminate, with a tighter polyester weaving, high tensile strength, and dimensional stability. That means a longer life in daily adverse conditions. Our fabric has a 5 year warranty, and it will out last other comparable slide topper fabrics including the OEM fabrics that don't last. They are UV and Mildew Resistant, easy to keep clean, and will look good for many years to come. Watch our video: How To Remove And Install Your New Slide Out Awning Fabric! DIY and Save Money. If your slide out awning fabric needs to be replaced, we have the solution to complaints about OEM manufacturer fabrics that don't last. How To Remove And Install Your New Slide Out Awning Fabric. It's so easy anyone can do it! No special tools needed!